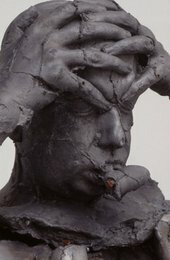 Emotional Detox is a series of sculptures made of lead and cast from Marc Quinn’s own body. Detoxification is shown both as an overpowering physical convulsion to rid the body of poisons, and as a psychological battle to gain mental stability. This struggle against dependency involves a painful release as repressed emotions are newly experienced, forced out and sweated through the skin. These sculptures are inspired by a traditional iconography – the seven deadly sins: anger, avarice, envy, gluttony, lust, pride and sloth. They are not, however, direct representations of those vices. Instead, the busts convey the impact of a body grappling with conflicting responses and venting powerful emotions. Severed limbs, embedded nails, scabby ridges and cuts in the torso present a devastated condition. The toxicity of lead, the substance from which they are made, suggests the unlikelihood of a complete removal of the poison, which pollutes even the vascular. system within. Yet the body apparently survives the scourging and stigmatisation to be revived – if not physically reunified – and spiritually sanctified in the form of relics of harrowing, cathartic experiences: the torso shells are presented as temples of purification. Square niches cut into the torsos drip with candle wax and the figures are transformed into devotional objects of contemplation. The slow congealing of wax - ethereal blue in colour – suggests more subtle currents and layerings of passing time, and perhaps also the secretion of plasma in the healing of wounds. Perhaps unexpectedly, considering the pressure and intensity they embody, the figures evolved through stages of disciplined preparation rather than abandoned outpouring. Quinn used photographs and collaged drawings to select poses and combine body sections; not all couplings of head and torso belong to the same casting session. His performance and method was thus different from the mescaline-influenced, self-portrait snapshots (mini-performances staged in a station photobooth) used by Arnulf Rainer as a basis for his ‘face farce’ drawings of the late 1960s and 1970s. Quinn’s controlled excess emulates more closely the ‘character heads’ made by Franz Xaver Messerschmidt in the late eighteenth century, some of which were also cast in lead. The results of a more time-consuming process than Rainer’s swift scribbling, Quinn’s sculptures pose a question of whether facial contortions can authentically convey fleeting inner sensations, or whether their features express no more than frozen muscular reflexes. 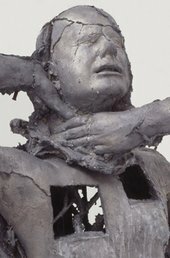 Transformative processes in the foundry produced by changes in temperature and the differing heat resistence of various materials used in casting – plaster, wax, rubber and lead – become analogous to the emotional volatility shown by Quinn’s figures. In Emotional Detox imperfections of shape and of surface remain largely intact and contribute to the raw directness of the figures. Seepages or surface blemishes which are usually erased by patching, grinding and patinating are liberated. The accidental by-products of a dynamic process are no longer suppressed. Emotional Detox is a development from Quinn’s earlier works, in particular the blood-filled cast of his head, called Self, 1991, and the suspended latex body sheath You Take My Breath Away, 1992. Unlike Self which requires continuous refrigeration to sustain it, or the limp You Take My Breath Away, these new works do not require external support systems and retain their outward form after being vacated by their subject. In Emotional Detox Quinn has created a complex dialogue between his material, subject and medium that is rich in association and vibrantly direct. Born 1964 in London. Assistant to Barry Flanagan 1983. Graduated Cambridge University 1986. Lives and works in London. Marc Quinn talked to the broadcaster and critic Tim Marlow about recent work.